Frequently asked questions and answers regarding the function and role of compact office users in ICOTS. I am a compact office user and processing an incoming activity, I have an option to delegate to a supervisor or assign to a PO. What’s the difference between Delegate and Assign? Most incoming activities have options for a Compact Office user to either assign to themselves, forward to another member, send back, delegate to a supervisor or assign to a PO user. Assign directly assigns that case and activity to the user to complete. Delegate is an action which moves that assignment ability to a user. Therefore, delegating to a supervisor does not assign the activity it only gives that user authority to assign the activity to a subordinate user. When the compact office approves an RI, how do we assign it to the supervisor in the county it's being assigned to or to the PO to whom the offender will report to? Compact Office and PO Supervisor Users have a Manage Case Load function within the User Tab. The User in the Compact Office who completed the Request for Reporting Instructions Reply is assigned the case until it is reassigned as appropriate. That user, or another Compact Office User, will need to visit the Manage Case Load feature and reassign to a user in the field as appropriate. 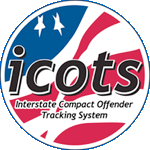 If we have outgoing pending cases in our Interstate Office and we (Interstate Compact Office) want to enter them into ICOTS instead of making our locals do it – how do we accomplish this? Members of the compact office have all the same rights as a PO. New requests can be entered by the compact office staff by using the “Assistants” tab.